This is a somewhat simple query that identifies CPAN authors that use modules from the Test namespace in their runtime phase, according to the data from CPANDB. Some modules might actually require modules from the Test namespace in their runtime phase, but this many? I would think that this is an indicator that some authors mark their test requirements in the wrong way (or CPANDB is wrong). Maybe some Makefile.PL cleanup should done? This is a response to John Napiorkowski's article: Why All the Hate? Matt S. Trout was talking about the fact that we need to become better with marketing. I second that. One of the tools of marketeers is the survey. My suggestion is this: Why don't we publish a survey about perl and get it answered by as many people as possible, even the nay-sayers, reddits and diggers? At least this way the perl community as a whole could better grasp what parts we really need to focus on, based on user feedback? And we'd even include people outside the core community. How much do you like perl? How much do you dislike perl? How long have you been using perl? It would be wonderful if either EPO, P5P or the Perl Foundation would find the means to issue a survey like this. If it comes from either of these organisations it would probably be taken seriously. This way we could really find out what matters to people, instead of just "guessing" what it is. I know that something like this was done in the past, and it was what ignited the whole perl6 process. Isn't it about time we do something again? If you have more suggestions for questions/options to the survey, please state so in the comments. Other comments are also most welcome. X11 forwarding to Ubuntu server not working with PuTTY and Xming? I was stumped why I couldn't run X11 software on my Ubuntu server installation and have it forwarded through my SSH connection to my desktop Windows machine running Xming. Apparently installing an X11 application (gitk) didn't pull in that dependency. Now I can finally run gitk and visualize those complicated git graphs. Yay! I was reading Jay Kuri's article about CGI alternatives the other day, and I got thinking. How much memory does these various modules for simple (or advanced) web serving use? After having looked through Mark Stosberg's article on startup penalties I was even more bewildered. It was hard to track the actual cost of each module, because the perl interpreter footprint was also in there (and that we cannot do anything with). I wrote a small script called perlbloat.pl to check how each of the mentioned modules come out. It uses the GTop module, which is Gnome's cross-platform way of counting things such as memory. What is interesting to notice here is that CGI::Application actually comes out with a lower footprint than CGI::Simple. Considering CGI::Application has a somewhat bigger API this is surprising. 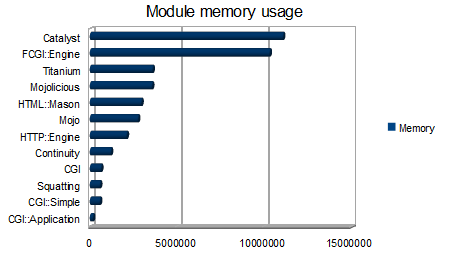 There is of course no surprise that Catalyst is the most memory hungry module of them all. What seems surprising, though, is that FCGI::Engine eats so much. It would be nice to know why. If you consider these numbers I would like to know good reasons for using Catalyst in a high-performing environment. To me it seems like the application servers will take a trashing because of the increased memory usage of each process if you compare it to e.g. CGI::Application. Even Titanium which is pretty feature packed comes out at almost three times less memory used. What you can see from this last dump is that Moose and DBIx::Class shares some code (132k), but it is mostly irrelevant when you consider the cost of the rest. If you have something to say about the numbers I've collected here I would love to hear them. Feel free to post comments.